The game the whole world was, allegedly, waiting for – and not without reason. There were many interesting aspects for the tactics fan too. United changed on four positions. Among others, Phil Jones had to miss the game due to injury and Wayne Rooney found himself on the bench, a surprise. Some were expecting a 4-3-3 with Ryan Giggs as central midfielder in his 1000th game as a professional, but Ferguson chose differently. The Welshman started on the right flank in a 4-4-1-1/4-4-2, while Nani started on the left. Danny Welbeck played slightly staggered behind Robin Van Persie. The two acted occasionally at the same height defensively and changed positions offensively. Most of the time Van Persie’s job was to look for openings and help transition. Time and again he was looking for open space and dropped back shortly to help with his great technique. Jürgen Klopp once called Van Persie the best striker in the world, because he thought him able to play all positions in attack. One has to add that Van Persie is able to play any way as a central forward, too. He is able to drop back depending on the situation, he is able to help combinations, his pressing resistance makes him an option in transition and last but not least, he is capable of world class performances as a classical forward centred on the box. Welbeck complimented him well in attack. The young Englishman moves intelligently and knows how to use space. He also plays combinations well and has great athletic abilities. More than once he ran into space with determination and speed and tried to offer himself for through-balls. One example from the 25th minute: Van Persie stops a long ball, Welbeck passes him running, carries the ball forward and gets to finish in the box. Almost as if in passing he also played an important role defensively, in combination with Van Persie. 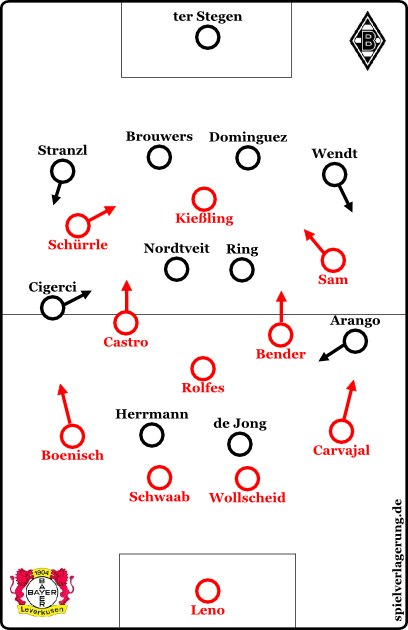 Within United’s highest pressing formation, they paid attention to Xabi Alonso. The two Real centre backs were rarely pressed in possession. United formed a tight 4-4-2 instead, with Van Persie and Welbeck positioned next to Alonso. Consequently, Alonso was lacking space and was rarely a safe passing option. This denied Real their playmaker and most important player in build up. Real was forced to the flanks. When they advanced on the flanks, their connection to the centre was cut well. Xabo Alonso could not even serve as a safe backwards passing option, because Welbeck man marked him in these situations. United’s formation worked well, when Real advanced. Ryan Giggs sat deeper and wider on the right than Nani on the left. He could separate Fabio Coentrao from Christiano Ronaldo this way and support Rafael very well. United’s full backs were man marking Real’s wingers and only gave them over to others when the wingers moved to the centre. Gigg’s experience and intelligent play shone that way. Nani was better positioned to start early to break and with Arbeloa, he was up against a less offensively-minded opponent anyway, explaining the reason for the reversed positions. Patrice Evra took care of Di Maria with loose man marking. The latter had been stellar during the first leg. In the end, few balls found their way to Di Maria’s flank. Real’s attacks rarely found their way to United’s goal, where Real usually had to finish under pressure. The great coverage and interplay on United’s side was especially impressive. Michael Carrick covered for the movements of the advancing full backs without mistakes. The right six moved back and forth horizontally and closed the space behind the attacks down the wings. Ferguson’s team was able to exploit the defensive freedoms afforded to Ronaldo this way. Rafael advanced past Giggs often and gave the game depth. 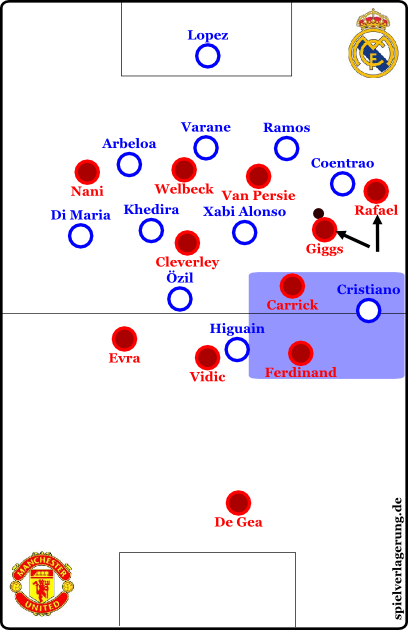 Giggs was able to play a few good passes into the middle or to the front, because of his inverted role, the open space created by his nominal full back and his pressing resistance. United overloaded flanks to get balls to the centre. They wanted to get more out of the the interplay between the forwards this way. Away from the ball, United showed more interesting movement to cover. The full back on the ball-less flank stayed deep and supported the centre backs. Together with Carrick, there were four players covering, allowing Tom Cleverley, strong in combinations, to move up and get involved. The winger on the same flank was looking to give width and moved toward the second post for crosses from half space. Similar ideas were used when United was shifting. Away from the ball, one player stayed farther wide than usual. The offensive outside player was also staying relatively deep and wide depending on the situation, covering the opposition full backs. Finally, United showcased one of their classic strengths as well as a new one. First the classical strength: United defended their penalty area well. Real was able to finish a number of times, but many were from a distance, from bad positions or under pressure. Thanks to Ferguson’s genius, United’s formation was harmonious. Rio Ferdinand and Nemanja Vidic are, despite their injury problems and advanced age, still world class when it comes to defending the penalty area on good days. Their defensive work tonight consisted mainly of intelligent advances, good synchronisation, covering for the players next and in front of them as well as the blocking of shots and crosses. The „modern“ strength was the counter pressing. It was not practised as collectively as by Josep Guardiola’s FC Barcelona and Jürgen Klopp’s BVB during the two championship seasons, but it was used effectively a few times. United moved towards the ball aggressively with a fanned out formation if possible. Tom Cleverly, Ryan Giggs and Denny Welbeck were especially strong. From them originated the non-verbal call to pressing – the others mostly moved up intelligently. Potential breaks by Real could be broken up. How aggresiv was Real going to be after the first leg draw? There was no attack-pressing, but Real’s way of playing was higher and more active. Somewhat surprisingly Real did not use their usual 4-4-2 pressing. Mesut Özil seldom played next to Gonzalo Higuain. Usually the Argentinian centre forward was the only one to try and throw a wrench into United’s build up. He tried to isolate the two centre backs by running at the centre back in possession in an arch-like movement, cutting off the other. This was supposed to benefit the two-three midfield, but was only partially successful. Other than that, Real was not convincing most of the time. After the beginning, United adapted their passing patterns to use some long, high balls and there was little pressure. In attack, Higuain moved to the flanks and opened space for Christiano Ronaldo, who had a free role. 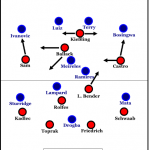 Mourinho was constantly looking for a solution with many micro-tactical changes. Di Maria was given more freedom over time. From the 25th minute on, he tended to the left flank and gave width to free Ronaldo once and for all. Coentrao played more diagonally. The two were trying to open gaps for Christiano Ronaldo, who almost acted like a centre forward. Higuain moved more as well, drifting right or dropping deep to allow Ronaldo to occupy the centre forward position. 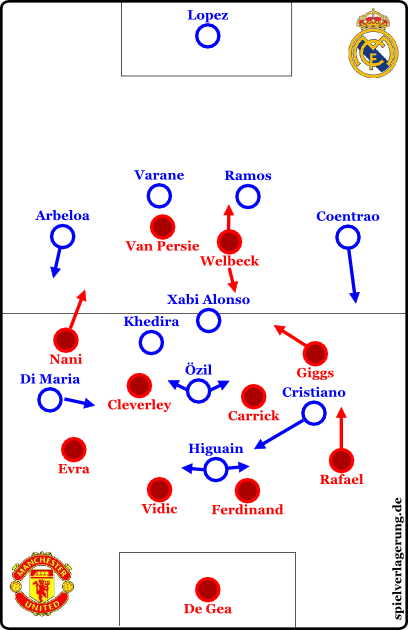 Because of United’s compact formation and intelligece in defence, there was little effect. Real hindered their own build up instead. Mourinho was tinkering here, too. Khedira moved more vertically for a short period, later he occupied the half space. He dropped back to the right, between full and centre back, pushed Arbeloa up and so compensated for Di Maria’s movement. More tinkering followed: After Di Maria’s injury, Özil was playing on the right flank. 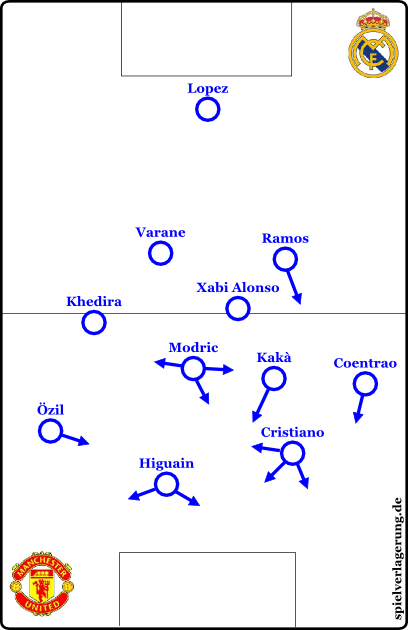 Kakà, who was introduced for Di Maria, took Özil’s place in the middle, while Coentrao moved up even higher on the left. Xabi dropped deeper and was released to be another passing option in attack by Ramos a few times. However, the only successful change was due to United. Mourinho reacted immediately when Nani was sent off. He took off Alvaro Arbeloa for Luka Modric. Mesut Özil was working the right flank alone in attack, covered by Khedira. Modric played Xabi’s role, but higher up the pitch. He was now the team’s focal point and structured play. United formed a 4-4-1 with Welbeck on the left, but became too passiv and deep. Modric had too much space and was able to get off a great shot, which led to the equaliser. Only minutes later Real scored again. Now both managers reacted. Real substituted Özil and formed a 4-4-1-1/4-5-1. Ronaldo and Higuain occupied the wings, Pepè was introduced to play the right full back an Kakà was the focal point for breaks next to Modric. Kakà also helped out in defence and there were many changes of position of the central players, offensively and defensively. Real’s play was extraordinarily fluid and, as usual, Ronaldo gambled when appropriate. United on the other hand introduced Rooney to build play with three forwards. Rooney played left, after Ashley Young’s introduction he went to the right. The central in the 4-2-3 were Carrick and Giggs. The full backs continued to move up as well, especially Rafael, who was supposed to grant Rooney an inverted free role. There was no change to the score, but United generated a few good scoring opportunities. Defensively it was an outstanding game by Manchester United, who seemed to have disheartened Real after twenty balanced minutes. Before the sending off, they looked very stable, defended well and were able to create a few opportunities on the break. They appeared to have lost the thread for a short time after going one man down. Real Madrid were able to use this after many changes and Modric’s introduction. After the 1:2 the game went flat, tactically and technically. There were more opportunities to score, but the intensity and concentration in transition was lost. Neither team worked as much in defence. In the end, it was a lucky win for Real Madrid at Old Trafford. In this hour of defeat, we should remember the losing side – Ryan Giggs, the collective and Alex Ferguson. All of them impressed for long stretches, adding good tactical ideas and implementing them well. They were surprisingly “modern“ with their situation-dependent counter pressing and very strong pressing resistance. For Real we have to applaud Luka Modric and José Mourinho. Translated by Fabian I. – highly appreciated! Spielverlagerung thanks you! SAF outcoached JM. Round of applause. Why not establish „Halbraum“ instead of half space when there´s no similar word? Anyway….there´s no similar word for Kindergarten, too. Great idea! I actually read „Gegenpressing“ used by a (I suppose) english commenter in a comment on zonal marking recently. Asking an online translator I got some alternatives for Kindergarten. But it is true, it is like an English word. But how to say it the worst way: Don’t compare apples with bears. Ha in die klassische typo Falle gelaufen: pear, not bear. doch mal wieder ein deutsches Wort einenglischen könnte. um so besser. Hauptsache man kann sich verständigen. Great article,this website is now one of my favorites having only discovered it last week. One problem though,what does the phrase ‚half spaces‘ mean? In English it doesn’t really make sense.Maybe there is a better way of describing what this means in English? just trying to help. I appreciate the amount of work that the original writer and the translator put in,I was reading some of the tactical articles on here and although I could only partially understand them because I was using a online translator they are really interesting and more complex than any other website I have seen. The half space is the space between the middle and the flank or the space between the middle and a side. At least it’s that way in German (Halbraum) and we translated it that way, because I thought it suits the English language quite well. Also you have „half-backs“ and „centre-halves“ (#4 and #6 here) so it also has a historical context. We use „half player“ also quite often, we call the „2“ in a 3-1/1-2-1-midfield (a diamond) that way. Or the two outsides in a flat three. Look at that graphics, here it would be Bender and Castro. On the glossary of Zonal Marking there is a nice, similar term: „Carilleros“; but we used not only for a midfield diamond. IMHO it’s sometimes better not to translate words but language. There is no need to invent new translations because someone is to lazy to find out the right words and terms in a lanuage (no offense). I just want to say, it is a difference between a „Halbposition“ and „Halbe Position“ or „Halbspieler“ and „halber Spieler“. For me, that difference is lost in the translation. Sometimes the more complicated way to describe the player on the side of a midfield diamond is the better way to do it. A translation is not only about translating words. A German „Halbraum“ is maybe better translated position/space (just) off center. I doubt there’s a proper word for „Halbräume“ available in English, but it is the space between the center and the sidelines. I guess „half space“ is due to the online translator. Hmmm…so what´s the word? It means: the space in between the middle and the right or left side. Hope you´ll understand. Have to improve my english education. The online translator did not want to use the term „half space“, it was my idea. And I still like it, it is one of many holes in the English language regarding tactics. Like counterpressing. If there’s a good, established alternative to half space, I’d be glad to use it. RM and I took half space, because it was the best we had. Else I’d be left with saying „the space between the touchline and the penalty area and the middle of the park“ each time and that’s not going to fly. On SV there’s the tactics lexicon. Perhaps you could translate it or (more important) make an article with and about German-English football terms, especially hard, special and new ones like counterpressing and half spaces. Describe them in the other (mostly English) language, to have a football dictionary. You could expand it with every English article in the future and it helps non-German speakers to read SV. If readers have difficulties in the articles, they could continue there (perhaps a static link in each English article of SV? ), and if English speakers have recommendations (e.g. the terms „counterpressing“ of „half spaces“ are wrong and there exist „proper“ translations) this page could be updated easily. This football dictionary could be a project of several German and English (or even other languages: Italian, Spanish, …) speaking blogs/sites (Kicker.de? )/fans, if there’s enough need for it. I wasn’t aware that there’re several football terms for which there’s no proper translation. Rooney may have failed to deliver in the first leg, but surely he would have been a far better option upfront, when you’re one man down but your opponent still needs two goals? More aggression and range for starters. Also the energy of Kagawa would have helped quite a lot to keep Modric at bay, I’d think. Khedira wasn’t a thread until then and hardly would have become one, so a player on the left who is comfortabel drifting inside and pressing helps to reduce the available space for Reals abundance of playmakers on the field. Wellbeck defended a winger who didn’t really exist instead. And still, Kagawa and Rooney wouldn’t have been a lesseer thread than Wellbeck and RvP on the break. So, what was SAF thinking? If at all… seems like he really lost it there. A lack of tactical awareness from Fergie, in not only team selection, but in failing to react to the red card and inciting the crowd into anger, he should of put on a cool head and calmed his players down, instead he let them lose their cool and consequently the game. After the sending off, Ferguson did the logical thing to keep the team’s shape by moving Wellbeck left. But van Persie could have dropped to challenge Alonso (neither Ramos nor Varane offer much threat building up from the back). Alternatively, van Persie or Wellbeck could have been taken off for Young or Kagawa respectively. In which case Wellbeck could have continued his work on Alonso (with Young coming in for the Nani role) or Kagawa would have taken that job and van Persie gone in to the inside left position to either pin Khedira somewhat or take advantage of his runs. In the end, Ferguson showed he knows how to prepare a team but is somewhat too wedded to his initial plans to change them. The final pressure on Real’s backline came more from typical United’s surges than actual tactical changes. Mourinho reacted very well and fast (as always) to his man advantage, but will have to do much better against other sides like Bayern and Dortmund. What do you think Spielverlagerung, Jurgen Klopp succeeding SAF as United Manager in the near future? But I don’t see Klopp leaving Dortmund anytime soon. He built this team, and I believe he thinks he can do even more with it. He has the chance to have his name attached to a soon-to-be legendary period in Dortmund’s history (if they continue to do as well for, say, 2-3 years that is), and he won’t throw that away for a PL job. Again, he’s already a hero, but he’s got the chance to become a legend within one of the most storied German clubs of all time. Which (German) manager would not like to have a go at that? He can always go to United later if he really wants to, he’s still young for a manager, only 45. While I agree wholeheartedly with your tactical statements, „should of“ gives me the shivers. It’s „should’ve“. Sorry for beeing a grammar nazi here, but that really bugs me. I don’t see Juergen Klopp leaving Dortmund in the near future. In the somewhat further future an number of clubs come to mind, Manchester United, Arsenal, Real Madrid, Bayern, Villareal, … almost everything is possible in 3 years. I know what you mean by people saying „should of“ it’s very bad grammatically and just plain lazy from my side :() no grammar nazi needed for that 1. Keep up the good work! Well, I can see where you’re coming from. Let me put it like this: the way you’re looking at it is prescriptive, what’s right is in the grammar book. That’s how it unfortunately is taught in school too often. Maybe unnecessarily long explanation, but the days of prescriptive grammar are over. Any decent student grammar you pick up these days will tell you, that many different usages of words are acceptable in different situations. It describes how English is written and spoken instead of prescribing how it should be used. Ich switche mal zu Deutsch, um meinen Punkt besser klar machen zu können. Ich sehe das nicht ganz so liberal wie du. Es gibt mit Sicherheit einen wachsenden Raum für diese „Lautsprache“ und für neue Wörter oder neue Begriffe für existierende Wörter. Das bedeutet aber auf keinen Fall, dass die Tage von guter Grammatik vorbei sind. Wie du schon richtig sagst, ist das auch eine Frage des Kontextes. Was in SMS, auf Facebook oder in der Disko akzeptabel ist, fällt hier im Rahmen eines ansonsten grammatikalisch eher „old school“ Text einfach negativ auf, erst recht in Bereichen, wo immer noch Wert auf Grammatik gelegt wird, wie im Journalismus, in Büchern oder wissenschaftlichen Papern. Es gibt also mMn durchaus viele Wege falsch zu liegen, nämlich indem der Sprecher/Schreiber selbst den Kontext missachtet. Wenn ich das aber in meiner Diplomarbeit bringe, bekomme ich zurecht einen drüber. Selbst wenn ich mich in einer ernsthaften Diskussion mit einem Freund finde, der mich nebenbei darauf hinweist und korrigiert, tut er das zurecht. Ich bin da halt vielleicht eher etwas konservativer und glaube, dass Regeln in der Sprache und im Leben einen gewissen Sinn haben und das Motto: „Erlaubt ist was gefällt“ doch zumindest mit Vorsicht zu genießen ist. Natürlich ist auch dabei keine scharfe Grenze zu ziehen, es gibt grenzwertige Fälle, über die es sich auch nicht zu streiten lohnt. „Should of“ ist aber mMn ein besonders grausiger Fall. Es ist keine Vereinfachung oder bessere Darstellung von gesprochener Sprache (wie es should’ve statt should have schon ist) es ist mMn auch keine ligitime Wortneuschöpfung wie Amirite, y’all, ain’t oder ähnliche es ist nicht einmal ein Flüchtigkeits oder Tippfehler, sondern einfach ein Fehler. Der Schreiber meint should’ve und vertut sich nur in der Rechtschreibung. Noch schlimmer, in dieser Art hat der Satz gar kein Verb. Also: In Situationen, wo man auch nur ein bisschen auf Rechtschreibung und Grammatik achten wollte oder sollte, ist should of für mich ein No go. ein ganz leichter beweis für meine these als hör-/rechtschreibfehler mit flüchtigkeitscharakter: man google zuerst „should of done“, danach „what of you done“. würde „of“ in der umgangssprache teilweise „have/’ve“ ersetzen, müssten auch bei letzterem treffer kommen. kommen aber nicht, weil in diesem satz das „you“ wie ein fels steht, sodass es klar ist, dass hier eine verbkonstruktion mit „have“ vorangeht und man es nicht mit „of“ verwechseln kann. dinge wie „nite“, „rite“ dagegen folgen einer logik – nämlich die schreibweise zu vereinfachen – und tauchen deshalb systematisch an einigen stellen auf. Tatsächlich habe ich den Eindruck, dass „should of“ primär und verständlicherweise von Muttersprachlern benutzt zu werden scheint. Es ist aber in meinem Eindruck noch weit davon entfernt „fast ebenso häufig“ benutzt zu werden. Ich würde mir mal Gedanken darüber machen in welchen (Internet-)kreisen du so unterwegs bist. Whi dunt wee all jusd write lik wee wont, dis wai everibadi gets hapi! That’s right, because it’s ultimately harder to read, induces headache and not at least it’s a little disrespectful to all readers. Should of, rite und nite sind alle phonetische Schreibweisen, also alle identisch im Sinne des Themas, das wir hier diskutieren. Da ist es auch nicht verwunderlich, wenn man of in anderen Situationen nicht auch als Ersatz von have findet, denn dort gibt es diese spezielle phonetische Konstellation nicht. Wo ist das Verb bei should of? Of! Of fungiert in diesem Satz als Verb und hat überhaupt gar nichts mehr mit der Präposition zu tun, denn es kommt ja auch von der phonetischen Schreibweise und wird nicht entlehnt. This is getting way out of hand guys. Its no fun to visit forums that have so much besserwissers around. This site is about football tactics, isn’t it? Stop it, and we can all enjoy our time here. You are right, that criticism has to stop at some point. But it is also a quality of SV that the readers or guests have the opportunity to give their response and make the project a little better every day. SV has come a long way and is a big success. Part of the story is the will to learn every day and become a better project the next day. The step to go English is brave. Similar to the step to start this project, it is not perfect from day one. Most people are not offensive, they just want to help to improve the quality. Like they do with comments under an article in German. Auch nachdem die Vorrunde nun fast vorbei ist, sind sich die Leverkusener Anhänger unschlüssig: Was sollen wir von diesem Robin Dutt halten?